Choosing the best site for the Cell Station requires careful planning and testing of essential areas. The best location may not always be convenient for installation. Read the following information before installing the unit. Characteristics of Radio Waves: The transmission of radio waves and the Cell Station coverage area depend on the structure and materials of the building. Office equipment, such as computers and fax machines, can interfere with radio waves. Such equipment may create noise or interfere with the performance of the PS. The illustration shows the special transmitting patterns of radio waves. Wall Concrete The thicker they are, the less radio waves penetrate them. Ferroconcrete Radio waves can penetrate them, but the more iron there is, the more radio waves are reflected. Window Glass Radio waves usually penetrate them. Glass with wire nets Radio waves can penetrate them, but tend to be reflected. Glass covered with heat-resistant film Radio waves are weakened considerably when they penetrate windows. Floor Ferroconcrete Radio waves can penetrate them, but the more iron there is, the more radio waves are reflected. Partition Steel Radio waves are reflected and rarely penetrate them. Plywood, Glass Radio waves usually penetrate them. Column Ferroconcrete Radio waves can penetrate them, but the more iron there is, the more radio waves tend to be reflected or diffracted. Metal Radio waves tend to be reflected or diffracted. Cabinet Steel Radio waves are usually reflected or diffracted, and rarely penetrate them. Wood Radio waves can penetrate them, but they are weakened. The example below shows the size of the coverage area of 1 Cell Station if it is installed where there is no obstacle. Note: Radio signal strength levels are measured during the site survey. 1. Obtain the map and investigate the installation site. Check the obstacles (e.g., shelves, columns, and partitions). Check the materials of the structures (e.g., metal, concrete, and plywood). Check the layout and dimensions of the room, corridor, etc. Write down the above information to the map. 2. Examine the service area demanded by the user on the map, referring to the following example. Draw the coverage area around a Cell Station. Extend the coverage area to 30 to 60 meters (98 to 197 feet) in one direction, depending on the materials of the building structures and obstacles in the installation site. Note that a Cell Station cannot be installed outside a building. 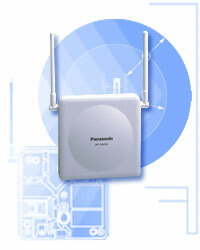 If one Cell Station cannot cover the entire service area, install additional Cell Stations as required. Overlap the coverage areas of adjacent Cell Stations. Where Cell Station coverage areas overlap, the PS will start call handover to the next Cell Station if the signal from one Cell Station becomes weak. However, if a PS moves away from a Cell Station and there are no Cell Stations available for handover, the PS may go out of range and the call could be lost. If the signal from the Cell Station fades, due to the structure of the building, there may be some handover delay. The user will hear a range warning before handover in this case. This also applies in the case of interference from 2.4 GHz apparatus. The room is separated by walls. The room is surrounded by concrete walls. 1. Switch the Radio Signal Test switch from OFF to ON. 2. Set the Cell Station number switches as desired. To see the radio signal strength of more than 1 Cell Station, a Cell Station number must be set for each Cell Station. If more than 1 Cell Station is in Radio Signal Test mode, each Cell Station must have a unique number. 3. After setting the DIP switch, connect an AC adapter or battery box to the Cell Station using a power supply adapter. 4. Install the Cell Station temporarily for the site survey. Install the Cell Station at least 2 m (6.6 ft) above the floor, keeping the antennas in the upright position. 1. Connect the cable from a Hybrid Port or the HLC4card to the Cell Station. 2. Pass the cable through the groove of the Cell Station (in any direction depending on your preference).